In traditional electrical lines, a significant amount of energy is lost while the energy travels from its source to homes and businesses due to resistance. Superconductors, materials that when cooled have zero electric resistance, have the promise of someday increasing the efficiency of power distribution, but more must still be learned about superconductors before they can be widely used for that purpose. Scientists at the U.S. Department of Energy's Ames Laboratory are using specialized techniques to help unravel the mysteries of a new type superconductor that was discovered in 2008. Ames Lab physicists were part of an international collaboration that also included scientists at Kyoto University in Japan, University of Illinois at Urbana-Champaign and University of Bristol in the United Kingdom to study the materials. The group found that magnetism may be helping or even responsible for superconductivity in iron-based superconductors. The results were published in the June 22 issue of Science. "The first step in designing superconductors for new technologies that will help save energy is better understanding of how superconductors work," says Ruslan Prozorov, who led the team at Ames Lab that also included Kiyul Cho and Makariy Tanatar. Unfortunately, most conventional measurements of material parameters, such as resistivity, aren't useful in the state of superconductivity. But Prozorov several years ago helped developed a technique to measure how far the magnetic field penetrates into a superconductor. This length is called the London penetration depth, and it reveals basic information about a material, even in the superconducting state. "London penetration depth is one of the few quantities we can measure in a superconducting state to learn more about what's going on, so the technique we specialize in here at Ames Laboratory was particularly useful for this research project," said Prozorov, who is also an associate professor of physics and astronomy at Iowa State University. "In this collaboration, we studied a barium-iron-arsenic-phosphorus material at near zero Kelvin, and our London penetration depth measurements suggested that magnetism is responsible for superconductivity in iron-based superconductors. 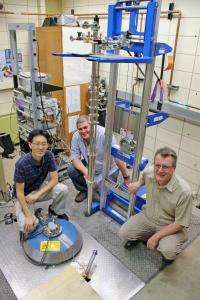 Typically, magnetism is detrimental to superconductivity, but when it is weakened enough, it might actually be helping." The international team's research helps answer one of the central questions about how iron-based superconductors work. "Iron-based superconductors may open the door to new energy technologies," said Prozorov. "But we'll only get there through materials science and understanding the mechanism of superconductivity in these new iron-based materials." This article is interesting but the presentation is short on details. In addition to the June 2012 article available as reported above, there is an article published 22 September 2011 by Prozorov and Kogan available publicly on the web entitled "London Penetration Depth in Iron-Based Superconductors." Plenty of info available there. Cho and Tanatar were also on that team. This is good research, and it seems consistent with other research on pnictide superconductivity, to the effect that magnetism is "responsible for superconductivity" (or at least helpful)in the pnictides. (The why? part remains unclear.) I think the second part of the statement deserves some discussion: "...when [magnetism] is weakened enough, it might actually be helping." that prevailed in the self-organization of the material at points above the transition temperature. Greater relative strength and range of influence might be the key details, not the diminished absolute strength of the magnetic force per se. The fact that superconductivity arises in iron based materials implies, as a matter of common sense, that magnetism must be beneficial as to pnictide superconductivity.